Lauren Rhoades drizzles gooey white chocolate and milk chocolate across a fresh batch of popcorn resting in two cooling containers on a January morning in the Meals on Wheels kitchen. Rhoades, the lead baker for Meals on Wheels, says the double chocolate popcorn she is seasoning is too sweet for her taste, but is a crowd favorite nonetheless. Instead, Rhoades likes the more off-the-wall, fruity flavors like berry and lemon — recipes she created herself and will be sold in the spring and summer. "You take a bite and you're like 'What is that?' That's so strange,'" she said. "And you take another bite and before you know it you've eaten all of it." But Rhoades is happy preparing any kind of popcorn because she loves her job and is supporting a commendable cause. Meals on Wheels, a nonprofit organization that provides food to seniors on 7710 S.W. 31st Ave. and other locations, is in the middle of its second year baking and selling artisanal popcorn to raise money to provide more meals for seniors. The double chocolate popcorn is a seasonal Valentines Day flavor. To order popcorn, visit store.mealsonwheelspeople.org/popcorn. "I love that I got to be a part of this and I'm truly hoping we can get it off its feet so that it can feed more seniors because that's ultimately the main deal in all of this," Rhoades said. "The more successful we can make popcorn the more people we can feed and that's always been a big deal to me." Before Rhoades' experimentations began, Meals on Wheels used to receive its artisinal popcorn from Poplandia. But once Poplandia was sold and the parternership ended, the Meals on Wheels staff decided to buy some of Poplandia's equipment and pop kernels themselves. After Poplandia helped her make the first batch, Rhoades garnered control of the popcorn production process. She used a couple months leading up to the December busy season to hone her craft and quickly got the hang of it. She says rhythm and timing are essential skills. "It's just a matter of keeping an eye on it. You want to spin it (the popcorn machine) long enough so that everything get coated evenly but not so long so it passes that point because it loses its shine," Rhoades said. "It's still very new and exciting but I feel like every time I make the popcorn it gets a lot better." 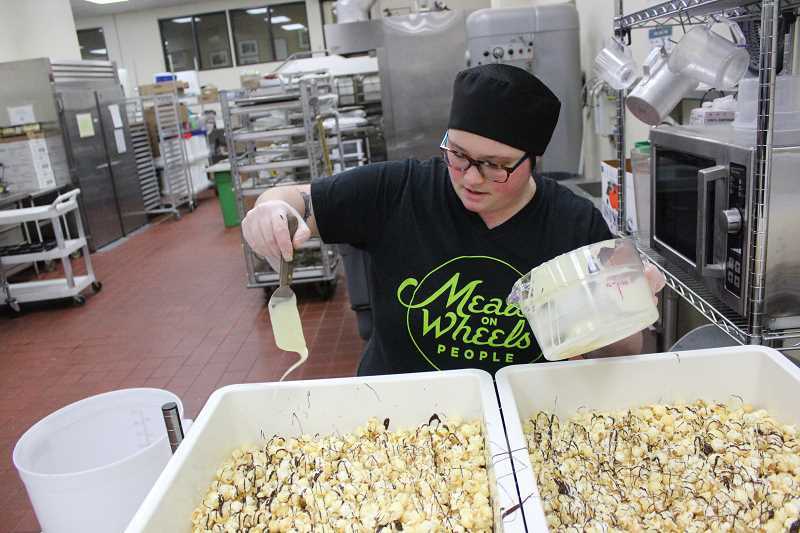 Along with Valentines' Day popcorns like white cheddar, chocolate peppermint and salted butter toffee, Rhoades has developed recipes for berry and lemon popcorn. She uses lemon extract and raspberry and blueberry extract to evoke fruity flavors. "I think it's delicious. It's not for everybody because it's a little odd but I think it's good," Rhoades said of the berry flavor. "It's not a flavor you would expect. It's very unassuming. It doesn't look like it would taste like berry because it's just a clear white coating on the popcorn and so when you go to put it in your mouth, it's like 'Oh, interesting.' It's very unique." Before unveiling a flavor, Meals on Wheels staff test it out to see if it's worth putting on sale. "When someone told me about candy flavored popcorn (the berry flavor) I was skeptical but it's actually really good," Meals on Wheels Spokeswoman Julie Piper Finley said. "She made one that tastes like captain crunch cereal. I don't know how she makes it taste that way but it does." Despite spending much of her work week during the busy seasons preparing popcorn, Rhoades still enjoys going home and eating it. "People are like 'You work with popcorn all day. 'How do you keep eating popcorn?" Rhoades said. "'I don't know.' I just love it." Rhoades wants more constructive criticism from customers and says Meals on Wheels is working on a survey and, potentially, a comment section on the website to facilitate feedback. And in order for her to be able to create more new recipes, Meals on Wheels will need to boost sales. She spends as much as 40 hours a week producing popcorn during busy seasons and as little as a couple hours during light seasons. She spends the rest of her time making pudding, cake, jello and other foods. "I would like to see a more consistent 20 hours a week doing popcorn. It would be cool if we can get it more regular throughout the year so that I'm half and half," Rhoades said. In mid-January, Rhoades was hoping for a busy Valentines Day season. "Hopefully I'm just slammed. I'd much rather be super busy with the popcorn because then I know it's selling and I know I'm moving toward a good thing," she said. "It's really exciting. It's fun to watch and fun to see it grow."